As delicious as that shepherd’s pie is, I was seeking something different the other day. Something new. We had ground beef and a craving for a casserole. What to make? Oddly enough we found ourselves stuck trying to figure out what to do with ground beef. It is such a basic ingredient that can be made into various meals, but it often stalls culinary creativity. Besides meatloaf, burgers, and the usual shepherd’s pie what can be made today? That thought prompted a Pinterest check. I wander that app often and post yummy looking ideas to save for later. There had to be a pin with ground beef for such a day as today. 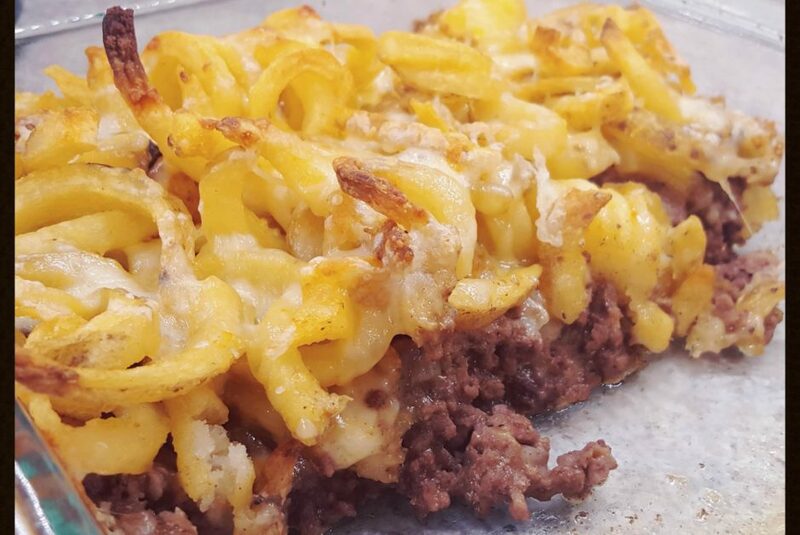 Sure enough, a cheeseburger casserole pin was in the It’s Dinner Time pinboard. Time to give it a try. Comparing a few similar recipes and going with ingredients we had, this is what I came up with. American Shepard’s Pie is what we came to call it since it has the similar meat and potatoes construction, but with the classic burger and fries taste we all know and love! I dare say it even tastes like In N Out Burger. You try it out and let me know! Preheat oven to 450 degrees. ** Brown onions in a skillet. Add ground beef. Brown and crumble the beef. Drain fat. Add remaining ingredients except fries and shredded cheese. Heat and mix until incorporated. Add any additional seasonings to taste. Transfer to a greased baking dish. We used an 8×8 glass pan. Spread the prepared beef filling in an even layer. Top with the fries. Bake uncovered for 20-25 minutes, until the fries are golden brown. Remove and top with shredded cheese. Return to the oven for 3-5 minutes until cheese is melted. Remove and let sit for a few minutes before serving. Serve with a green salad or vegetable and your favorite burger toppings like ketchup and mustard. 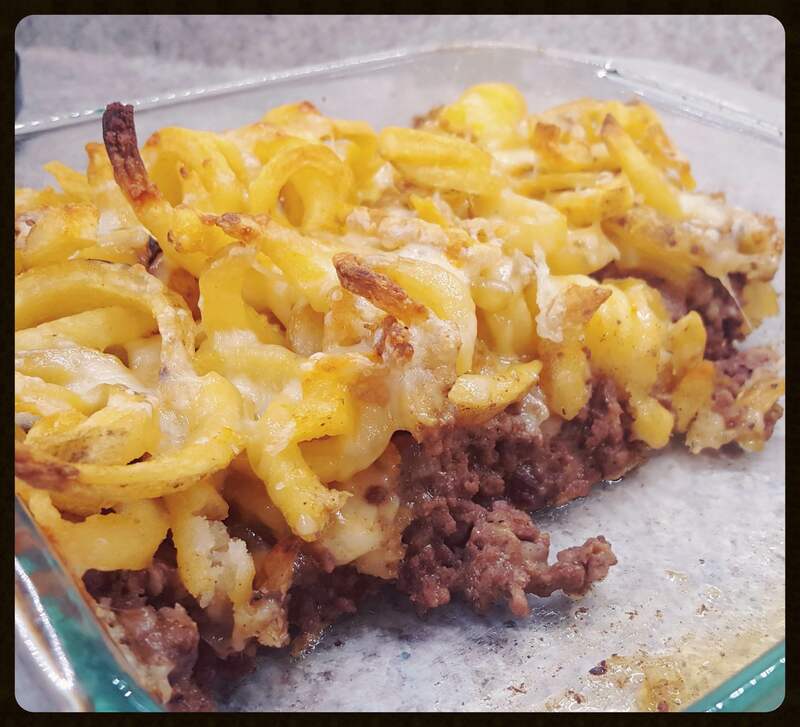 Surprisingly delicious, though it really shouldn’t have surprised us, it’s a burger and fries casserole after all! This is sure to be a new go-to here, maybe it can be for you too! What do you like to make with ground beef? What other ingredients pose challenges to your meal preps? Let us know in the comments! Swapping tips and tricks with fellow fans can be a great resource! Enjoy! **at our high altitude we baked at 425 degrees.